The Ducati Hypermotard is getting a significant update for 2019, receiving a revised 937cc Testastretta 11° motor, six-axis IMU, new rear subframe and a brand new look. 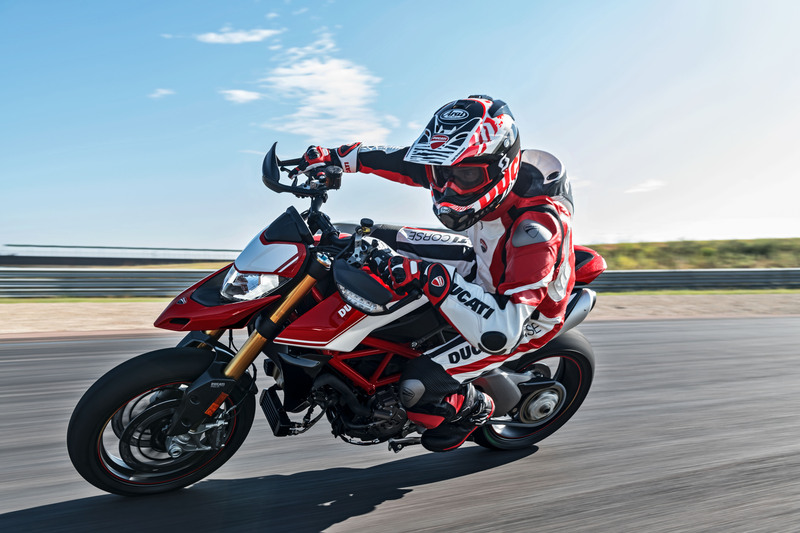 The 2019 Ducati Hypermotard 950 receives a new, sharper beak-style fender with an updated headlight (with daytime running lights where legal). The updated bodywork moves the radiators shrouds further forward, exposing more of the engine and steel trellis frame. The new trellis subframe reduces weight while making room to fit a pair of underseat exhausts. 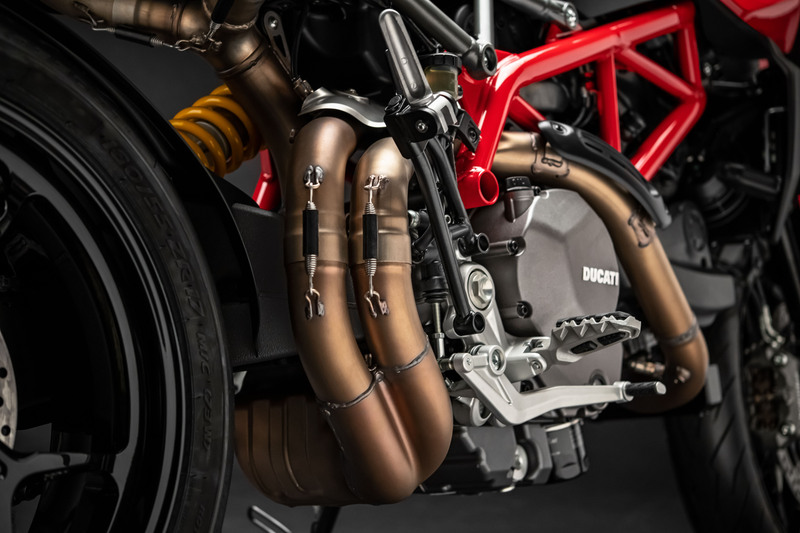 Ducati revised the 937cc V-Twin engine, employing new pistons with a higher compression ratio (13.3:1 compared to 12.6:1 for the previous Hypermotard 939). 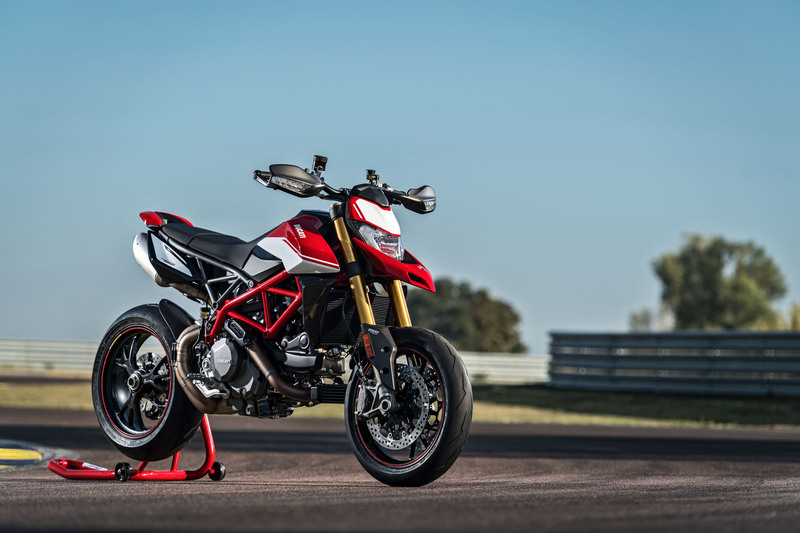 A new 53mm throttle body, revised exhaust cam profiles and the new exhaust system help bump the claimed power output to 114 hp at 9000 rpm (compared to 108 hp for the Hypermotard 939.) Torque output sees a slight increase as well, with Ducati now claiming 70.9 lb-ft. compared to 70 lb-ft from the 939. Ducati also says the engine produces 80% of its maximum torque at 3000 rpm, while 88% of its torque is available between 5000 and 9000 rpm. The self-servo wet slipper clutch receives a new hydraulic control system for lighter clutch control. Ducati also added a lighter shift control drum with an aluminum (rather than steel) chain tensioner and magnesium cam covers. Overall, Ducati claims the engine weighs about 3.3 pounds lighter than the previous powerplant. The Hypermotard 950 employs a six-axis inertial management unit from Bosch, along with an electronics package that includes cornering ABS, traction control, wheelie control, and up-and-down quick shifting (standard on the SP version but available separately for the base model). The Hyper 950 offers three selectable ride modes: Sport, Touring an Urban. 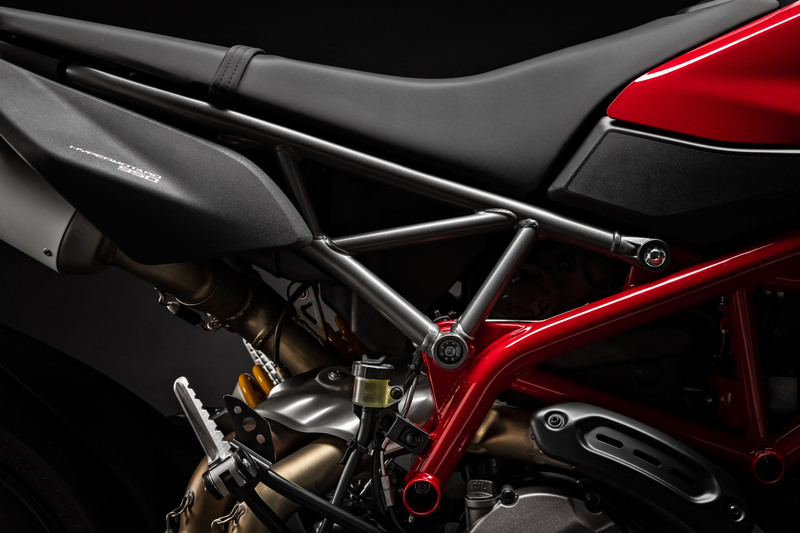 The new trellis subframe allowed Ducati to use flatter, narrower seat that reduces the inseam reach by 2.0 inches despite maintaining the same 35-inch seat height as the Hyeprmotard 939. New, wider tapered aluminum handlebars should provide a bit more steering leverage than the outgoing model. The Hypermotard 950’s suspension system is comprised of a fully-adjustable 45mm fork from Marzocchi, offering 6.7 inches of travel, that Ducati claims weighs about a pound less than the old fork. Sachs provides the adjustable rear monoshock with 5.9 inches of travel. The higher-spec SP version swaps out the standard suspension for Öhlins components: a fully-adjustable 48mm fork with 7.3-inches of travel up front and a fully-adjustable rear shock offering 6.9-inches of give. Ducati says the SP’s suspension allows for an extra 3º of lean angle. Both versions use the same Brembo M4.32 four-piston radial-mount front brake calipers, with 320mm discs. Brembo also supplies the 245mm rotor and single-piston caliper for the rear wheel. 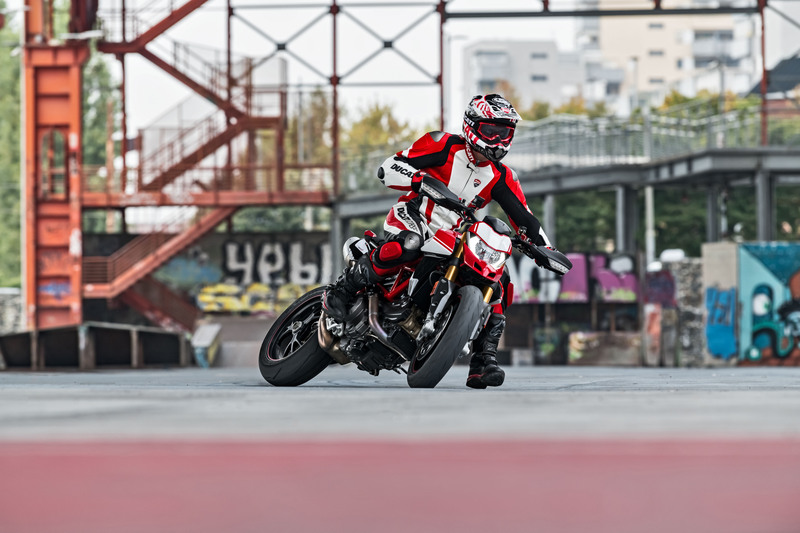 The standard Hypermotard 950 comes with 17-inch aluminum wheels shod in Pirelli Diablo Rosso III tires, while the SP version comes with forged Marchesini wheels and Pirelli Diablo Supercorsa SP tires. Other features include a TFT display, smartphone-connected multimedia system, removable passenger pegs and turn signals incorporated into the handguards. Ducati claims a curb weight of 441 pounds for the Hypermotard 950 and 437 pounds for the Hypermotard 950 SP.